The shop floor is clearly lagging in the adoption of cloud-based solutions compared to many other business areas like consumer, marketing, and sales. Not to mention, it’s likely that manufacturing software will remain in a hybrid cloud/on-premise model for the foreseeable future. However, one thing that’s clear is that the trend towards cloud has begun. To put this into perspective, we can take a look at data from our most recent research on Manufacturing Operations Management (MOM). We saw that 27% of companies planning to adopt MOM Software are planning to adopt cloud-based MOM software. And, more impressively, we saw a 50% increase in the planned deployment of SaaS vs. current deployment. In discussions with many different end-users and vendors, this move, along with the adoption of new mobile solutions and a mashup Internet of Things (IoT) enabled applications has re-opened the debate as to what constitutes Out-of-the-Box vs. Configured vs. Customized software. In this post, we’ll try to clear up a few points. Out-of-the-Box: Any functionality that comes shipped directly from the software vendor or can be configured easily (where “easily” means configured by a business, not IT user) with built-in workflow tools, templates, and/or best practices provided directly by the vendor. Configurable: Any functionality that can be created using built-in workflow tools shipped by the vendor. To be considered configurable, functionality should be forward-compatible with future releases. Customizable: Any functionality that is configured using built-in workflow tools shipped by the vendor, but may not be forward compatible with future releases. Also, other functionality not shipped directly from the vendor that cannot be created using built-in workflow tools shipped by the vendor. All customization has no guarantee of compatibility with future releases and contains the risk of being costly to maintain over time. To help make these definitions clear, it may be worthwhile to put it in the context of purchasing a new car. Most people who buy a car today are not so concerned about individual uniqueness and performance that they take the initiative to build a “Customized” car from individually ordered or built part pieces that are assembled in a garage (perhaps with the help of a service provider). In general the added cost, time, and lack of reliability outweighs the benefit. More and more we are interested in “Configured” cars, where we tell the dealer or even order off the website—the colors, trim, tires, engine, and transmission options in which we are most interested. In this case, we can often balance our desire for tailored performance and cost. Then of course many of us just don’t care that much about the car we drive—it's just a tool that delivers on a transportation need without delivering added value to our lives and we take the base model off the lot (out-of-the-box) that offers us the quickest and easiest time to value. Again, going back to our most recent MOM research, there is still a broad difference in the use of out-of-the-box software. 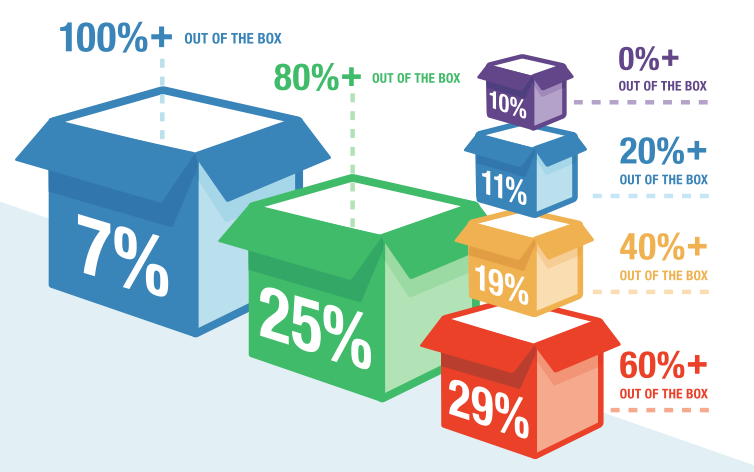 But it is clear that more and more companies are striving to get to the 80% out-of-the-box threshold with the remainder of functionality being delivered through configurations and an out-right elimination of customization. Finally, while selecting vendors and deploying software, another caveat manufacturers should consider is that not all templates/best practices are created equal. Many vendors just take the processes/functionality built for specific customers and call it an “industry template” in the next release. More forward looking vendors make a true evaluation on the needs of an industry and develop templates around these requirements. These hidden differences in robustness of templates can dramatically change the ratio of out-of-the-box to configuration to customization and can majorly impact time and cost.